Berridale: Why Live in Berridale? 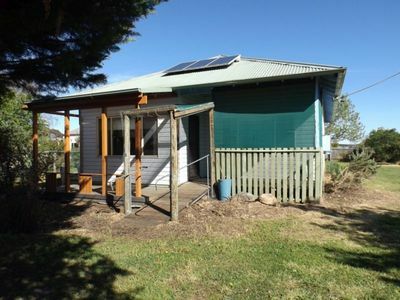 Many properties in Berridale are of weatherboard construction, are cottage in syle and include wooden features either internally or externally. Most are family or retirement homes, they are low maintenance and have developing or investment potential due to the large blocks of land. The newly build homes are mainly brick with corrugated iron rooves. Many have environmentally friendly power sources. The homes are well presented with a majority built in the 1960’s and 1970’s. Berridale has a number of established businesses in town, including a pub, winery, take-away food outlets, real estate agency, pharmacy, doctors surgery, ski and board hire shops, general store, bed and breakfasts, motels, service station, home interiors shop and a photography gallery. Berridale Public School is a primary school with around 100 pupils aged between kindergarten and year 6 serving the town and outlying areas. The school has recently received a $900,000 upgrade including a new library. Students usually progress to the Snowy Mountains Grammar School, Jindabyne Central School in Jindabyne or Monaro High School in Cooma. Students living in Berridale can commute to schools in Jindabyne and Cooma via the school buses provided. Berridale is just under 2 hours from Canberra, 5 hours from Sydney and 8 hours from Melbourne. There is limited public transport, but free school buses are available to students travelling to Cooma and Jindabyne schools. Berridale is located halfway between Cooma and Jindabyne, 30 minutes from Lake Eucumbene and the Snowy River and one hour drive from the skifields and Kosciuskzo National Park. The town has a 18 hole golf course, bowling club, swimming pool, primary school, soccer club, tennis club, CWA rooms and a sports oval. Berridale’s tennis court facilities feature four weather and two clay courts and are used weekly during the warmer months. Berridale also competes in the Monaro and District Cricket Association fielding one side in the competition and have won several competitions in the past. The Berridale swimming pool is open from November until March and was recently upgraded. It now features a lap pool as well as a shaded wading pool for the little ones. Golf is played at the Coolamatong Golf Club which is located around 2 km’s from the CBD. The course is 18 holes and features grass greens and is also used for the Diggers Golf Day held in May each year. The club house is located in the CBD. Berridale is also used as a training base for cyclists from all over Australia who use the many roads to train on as well as taking advantage of the high altitude. The Berridale Bakery offers a wide range of breads, meals, pies, pastries and beverages. The Berridale Inn has a licensed restaurant and there is a restaurant at the The Snowy River Winery on the main highway. There is a restaurant and microbrewery in Dalgety on the Snowy River open for brunch, lunch, wine and beer tastings. A free shuttlebus is offerred. Berridale is a small town of 844 people and is the administrative centre of the Snowy River Shire Council. Berridale lies at 860 metres above sea level between the towns of Cooma and Jindabyne. Aborigines long occupied the area but in small numbers. The European settlement was founded in the 1860s, when Scotsman William Oliver built his house there in 1863 and opened a roadside store, naming the location as a variation on his home town in Scotland, Berriedale. The dry climate later proved the town ideal for growing fine merino wool. Oliver’s store became a wayside inn in 1870, which still exists as the Berridale Inn, and a granite store was built. A post office opened in the town in 1869 with a telegraph office opening in 1870.The town grew slowly with the pastoral industry forming the mainstay of the local economy. The town hosted a work camp for the Snowy Mountains Authority although its population did not grow as much as Jindabyne or Cooma during the Snowy Mountains Scheme. Berridale is also home to one of the largest collections of heavy machinery and associated equipment salvaged from construction of the Snowy Mountains Scheme. In recent decades, Berridale has developed a tourism industry based on its location on route to the NSW snow fields. So if you are looking for Berridale Real Estate, why not talk to one of our sales team at Fisk and Nagle.